Are you a Crystal Lover? Attracted to healing crystals, but not sure where to start? I am being asked this question so many times. And I do remember how difficult it was at the beginning, when I have found myself in a similar situation. I fell in love with crystals very suddenly. I wanted to know everything about them, and I had so many questions… So I collected 9 crystals for you, which can be the bases of your crystal collection, as you can use them in many different ways to heal balance and ground your energies. Crystals are part of the mineral Kingdom, attractive and amazing high vibrational stones. Ancient civilizations such as Atlantis and Lemuria were relying on their magical power very heavily. They were used for healing for thousands of years. Although crystals are not considered as living creatures they have the ability to draw in energy, hold it and release it, when stimulated the right way. Crystals gain their energy from the sun and other planetary sources and from each other, when growing in crystal beds. As the sunlight passes through them they absorb most of the light rays, but some will be reflected, giving the colour of the stone. In this Chakra balancing set you can find the following Healing Crystals that you can also use individually according to your needs. Crystals can be an amazing help in so many ways. Their vibration aids you mentally, emotionally, physically and spiritually. If you are emotionally overwhelmed, even stressed out Red Jasper and Smokey Quartz can help you get centred. Smokey Quartz is also wonderful with pain relief. Citrine is a brilliant stone to attract abundance in every areas of your life. Sodalite unites logic with intuition and opens spiritual perception. New Jade calms the nervous system and channels passion in constructive ways… Look at your crystals and just feel which one(s) you are drawn to. Alternatively you can choose by their properties too. Carry it with you during the day and enjoy its helpful vibrations. Amethyst, Clear Quartz and Rose Quartz are The Master Healer Crystals. Amethyst is a gorgeous Violet or Purple crystal, known as The Stone of Protection, whilst Clear Quartz or Rock Quartz is usually see-through or White, which is The Stone of Harmony and Awareness, and Rose Quartz is a wonderful soft Pink Stone of Unconditional Love. Place them together in your home, and with their vibration they will create harmony around you. It’s best to have them at a place, where you spend the most time, so they can interact with your own electro-magnetic field. 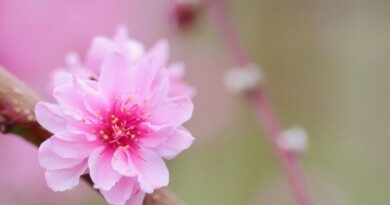 Grounding is simply the process of anchoring your being and your energetic body to the Earth. We naturally ground through the bottoms of our feet. So when you walk in nature you are conducting negative ions from the earth into your energy being and it helps you to nourish your energy field. The grounding stones in this set are: Carnelian The Stone of Energy and Vitality, Red Jasper is the supreme nurturer that brings tranquillity and wholeness and Smokey Quartz grounds spiritual energy and neutralises negative vibrations. Place them in the beautiful poach provided to carry them with you and enjoy their vibration and positive impact on your energy field. 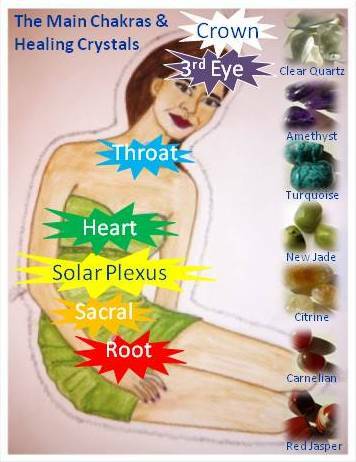 Chakras are energy centres in your body. Whirling wheels that are collecting energy from our environment and letting g it flow back there after used. For simplicity we will work with the 7 main chakra centres in our energy body, although there are many more of them. 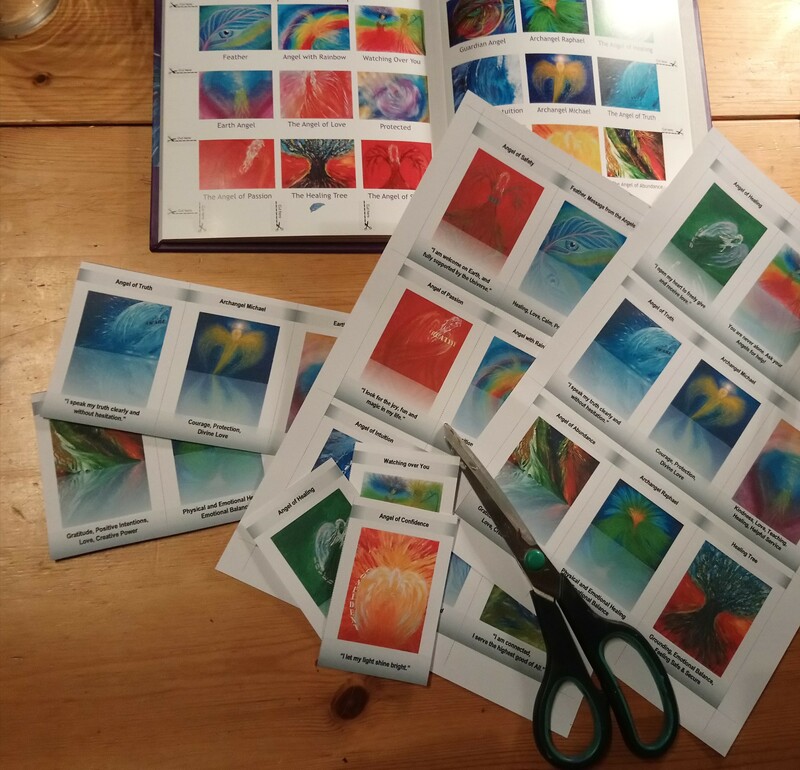 Each Chakra centre is corresponding with a ray of coloured light and connected to certain organs to distribute the energy to, and keep our energy system in balance. However our lifestyle, stress, illness can take us out of balance. Crystals are capable of working on many energy levels physical, emotional, mental and spiritual to restore the energy flow and balance it in our body. The colour of the gemstone usually matches the colour of the energy centre. Senior woman relaxing and lying on pad with amethyst, quartz and other crystals on body. To make the experience even more relaxing you can burn incenses, put on relaxing music, light candles, and make sure you are not cold. Find somewhere quiet, where you won’t be disturbed for about 20 minutes. In this set you find 9 crystals for the 7 main energy centres. 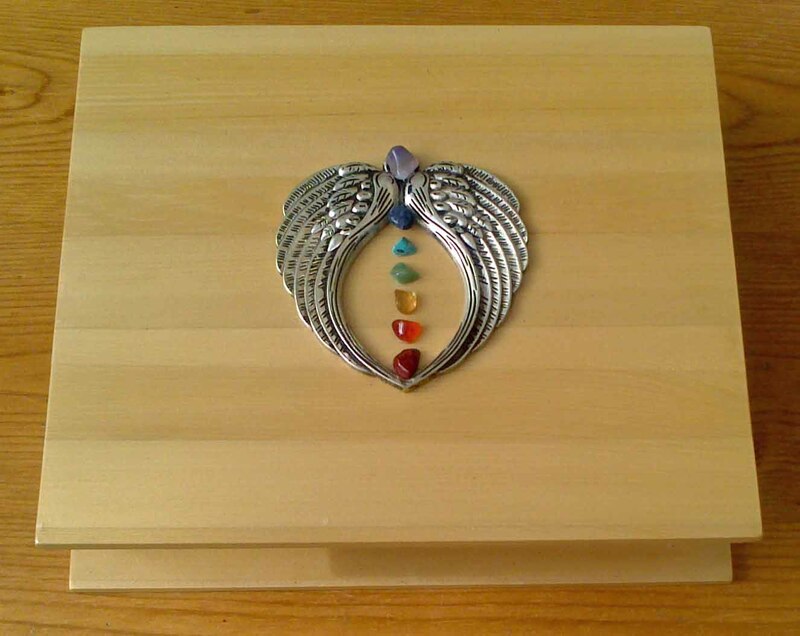 You will use 8 of the 9 gemstones to perform self-healing with crystals. Place the Smokey Quartz (Brown) at your feet, when laying down. 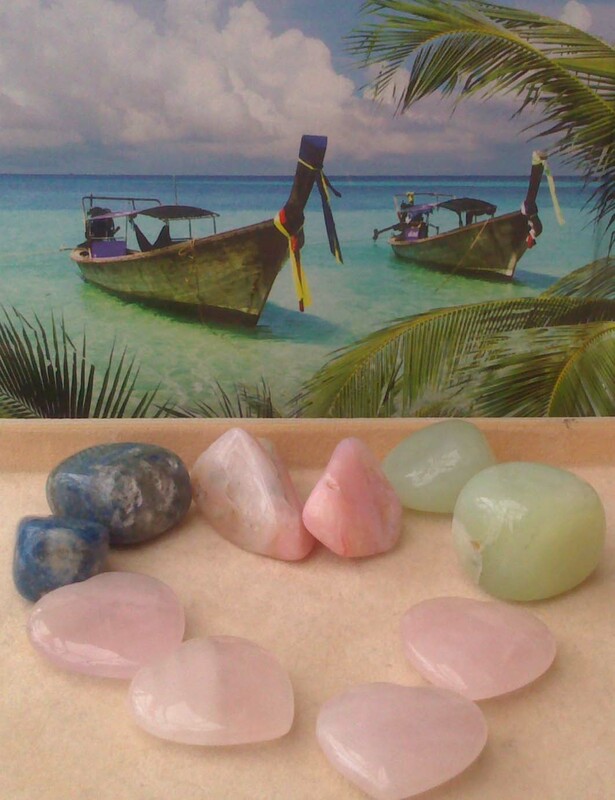 For your Heart Chakra choose between the Green New Jade and the Pink rose Quartz by using your intuition, whichever feels right at any point. Take some deep breaths, centre yourself and lay down comfortably. Now you have the Smokey Quartz at your feet, starting at your Root Chakra place one chakra stone on each energy centre. The colour of the gemstone usually matches the colour of the energy centre. 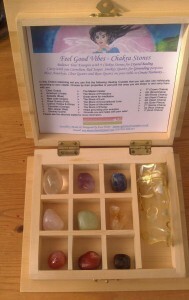 If unsure please refer to the picture: The 7 Main Chakra Centres and Healing Crystals. Now try relaxing, and enjoy the energy radiating from the crystals. Don’t worry if you can’t sense it, they are still working on you. When you finished, slowly start moving your fingers, hands, feet and legs and take the crystals off your body. It is wise to cleanse them under running water to get rid of the negative energies they absorbed. Store them in the box supplied. After you used your crystals for healing, or even if you just carried them around they need cleansing, as they soak up the negative energies from your system. You can cleanse them by washing them under running water, by running them through the smoke of sage incense stick, placing them on direct sunshine or digging them into the soil. Whichever way you work with your crystals you will benefit from it. Would you like to give it a try? 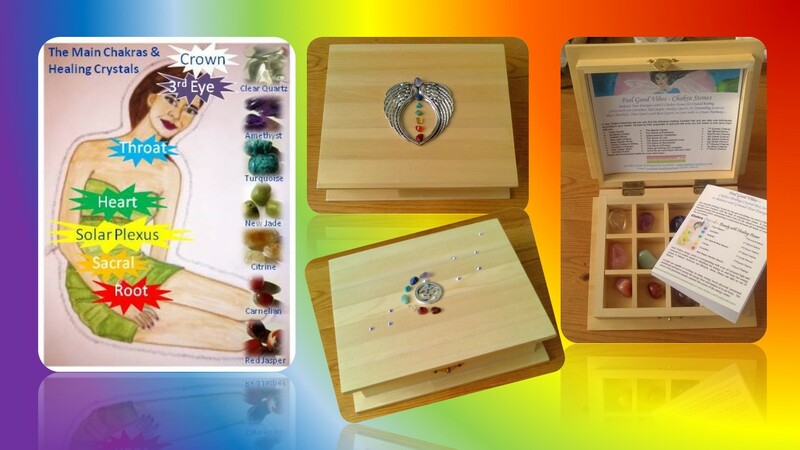 You can buy the above set along with my handmade chakra jewellery from my Online Crystal & Gift Shop. I hope you enjoy working with your crystals.